Have you ever been told that you're too hard on yourself? What about toward others? No one appreciates negative criticism, even if you believe you're being helpful. Believe it or not, your inner self doesn't appreciate it when you criticize yourself, either. Luckily, you can learn to have a more positive attitude toward yourself and others, and it isn't as hard as you might think. With a simple action here and altering a habit there, you'll soon find your outlook changing. When you feel compelled to criticize or judge someone, use your willpower to say something nice instead. * You could even keep your compliment to yourself and simply think it. However, you'll be surprised how much your relationships improve if you're willing to speak your kindness aloud. * Think about your positive attributes for a few minutes each day. Catch yourself when you start to speak negatively to yourself. Say something positive instead. 2. Consider the difference between giving advice and being critical. Advice is helpful and has a positive intention. Criticism has a negative intent and isn't helpful. * Think carefully - what are your true intentions? What are you honestly trying to accomplish? * Do you criticize yourself? Why? Imagine someone you cared about was in the same situation. What advice would you give them? 3. Start your day with a positive attitude. By getting your day off to a positive start, you'll be less likely to be critical of yourself or others. * Consider what makes you feel good. Is it music? Reading inspirational quotes? Remembering your favorite vacation? Making a list of things that fill you with gratitude? * Start your day with positive thoughts and energy. Carry that feeling for as long as you can each day. Thinking about what you don't want is addressing life from a negative perspective. Keep your thoughts focused on what you do want. Your mood will be lighter, and you'll treat yourself and others kindlier too. 5. Allow situations and people to be as they are. One of the easiest ways to make yourself unhappy is to believe that everything is supposed to be a certain way. You might believe that others should thank you for a compliment or offer you their seat on the bus, but they might not feel that way. In reality, everyone views the world differently, and your views aren't any more correct than anyone else's. If you think that everyone else should automatically see things through your perspective, you're likely to be critical and miserable. Ensure that you have a complete and accurate understanding before jumping to conclusions. The most critical people in the world are often operating with insufficient information. Before you say something negative, make an effort to get the whole story. Perhaps the most important issue is self-esteem. Those that are critical of others often do so to make themselves feel more important, superior, or dominant. It's also possible you're using criticism as a way of preventing others from getting too close to you. 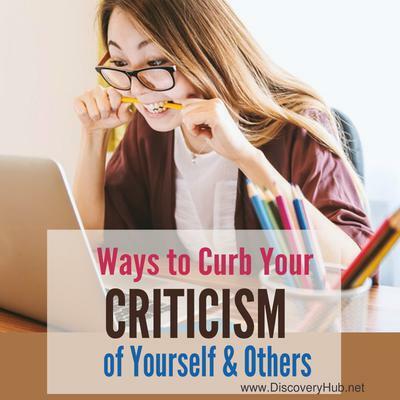 Consider why you're critical of others and yourself. The solution becomes more apparent if you correctly identify the cause. If you have a tendency to be critical, you can enjoy your life more by making a positive change. Learn to be kind and patient. It just takes practice. Be kind to everyone you meet. Be kind and patient with yourself, too. Before you know it, this behavior will become a habit and you'll discover that you've acquired a new, positive outlook regarding yourself, others, and life itself. Learn more here in my online self help super-site about How to build self confidence to become happier and more confident in your life. Do you have racing thoughts and anxiety? It's hard to focus on anything else when anxiety takes control of your mind. You're filled with worries and uncertainties. You can't calm down or rest. Fortunately, there are ways to control anxious thoughts, and it just takes practice to master the techniques. 1. Distance yourself from the worrisome thoughts. * The key is to reshape how you think about things. * When you get an anxious thought, immediately identify it as a sign of your worry and not reality. * Labeling your thoughts correctly raises self-awareness and makes it easier to control them. It also gives you something else to focus on instead of constant worry. * What is the real reason for this anxious thought? What am I really afraid of? * Is there real danger, or is my mind simply playing games with me? * Is the negative outcome I'm imagining likely to happen? * How can I stop or change these negative thoughts into something positive? Sometimes it's helpful to view your thoughts as data and your mind as a data processing center. * You'll get a lot of data coming in throughout the day. Some of this data can be incorrect and confusing. This is an example of anxious thoughts. * You may also interpret the data incorrectly. This means you allow the anxious thoughts to take over and control you. You let them grow and fester. * As the data processing center, you get to decide how to handle all the information. Remember you're in control. This means you can choose to toss out or ignore the incorrect data. * Also, keep in mind that the brain is designed to detect danger and is hypersensitive to it. You may pick up on things that aren't even real. * Avoid thinking too much about the past or future by interrupting these thoughts. Notice when you're thinking about the past or future and guide your thoughts back to the present moment. * Sometimes thoughts from the past can make you afraid of the future. Remember that the past doesn't have to repeat itself. You have the power to change how your future will be shaped. Anxious thoughts often prevent you from taking action. They keep you stuck in fear and worry. Learn to take action even when you're afraid. * Find one thing you can influence positively in that moment and take an action. * Action can actually decrease the number of anxious thoughts you have on a daily basis. It can show you that there's nothing to be afraid of, that you're powerful, and that you can make a positive difference. Some thoughts may be true, but they aren't helpful. * Learn to tell helpful and unhelpful thoughts apart. * Then, start to filter out the unhelpful ones. For example, if you know that the odds of making a perfect presentation at work are low, but you still have to do it, this is an unhelpful thought. It doesn't encourage you to do your best. Anxious thoughts don't have to control your life. You can use these tricks to effectively take control of your mind when you find yourself worrying. If these tips aren't enough, consider talking to a therapist for additional help. How do you handle it – or can you think of any additional tips you can share with others if you don’t have an issue with this in your life? Share them with us in our Comments below – or share this blog post on Twitter or Facebook or wherever you feel it could help someone you know.